Action movie star and martial arts master Steven Seagal is instantly recognized by his dark brooding demeanor, stance and facial expressions. Master variety celebrity impersonator Tim Beasley brings his ability to recreate his unique likeness to Steven Seagal to all manner of fun special events, such as movie themed corporate functions, Steven Seagal fan birthdays and other celebrations, and for exciting and hilarious cheer provoking action for conferences and sales - motivational meetings. Want to add some real punch and power to your sales meetings? Just imagine Tim as "Steven Seagal" all suited out in his hand to hand combat gear coming in quietly to your stage. He bows politely to your crowd, then without warning, in a burst of blazing action, lightening jabs, hand chops, thrust kicks and literally stomping the s--t out of a competitor's product, logo or poster ads, turning it literally into pulp -confetti - shredded wheat. He then stands staight, silently and stoically for a moment, then smoothly, calmly, turns back to face your group, bows, and then glides out quietly like a leopard after a jungle kill. Your crew, especially the guys, will howl and karate-scream their approval! Eeeeeehhhh, tahhhhhh!!!! 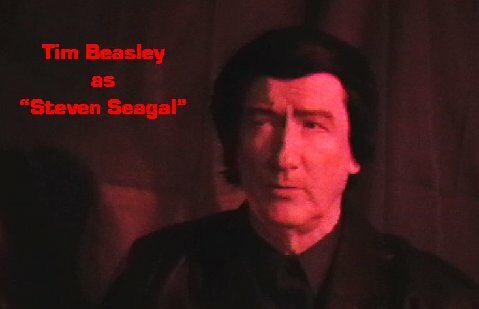 This is a still frame photo from a video Tim produced for a client's friend's bachelor party...It seems that the fellow getting married is a huge Steven Seagal fan.....watch for yourself at this YouTube link! Call 757-589-0903 We talk and text !